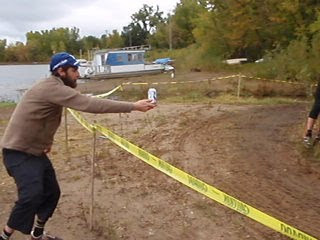 Saturday I went to the Hudson CX Race w/Mac, & The Hendersons. Good times were had by all, and there are pictures to prove it... The course was a mix of some tech dirt, sandy power sections, sandy running sections, and a water crossing. The Goodrich Team looked good; Scott E. Rob had some tubular issues. EZ E. Taylor took commanding lines thru all the slop and looked strong like ox!